SAP Community – Empathy where has it gone? While all the above might be very true, it doesn’t help the person who asked the question and at times makes them feel stupid. Cause/Effect – I feel stupid / I won’t ask questions. I search SAP for an answer. I read answers like the above. I won’t ask my question. So where has the empathy gone? Is it because too many questions fall in the range above? I didn’t believe him until I looked at the questions and answers here. And found he was correct. Instead of just saying search for it. Give the person the search terms that may lead them to their answer. Then suggest if they don’t find the answer to come back and explain what they have done. See the answer again. Links are frustrating. Not just to the person asking the question, but to the person searching for an answer. If they come back and the link could help, then cut and past some information into the question and ask if there is a bigger issue. An answer of you are using obsolete coding structures try with xyz. That one has to be the worst. It is really saying – don’t you know how to code right? Instead of that answer, find out what they want. Suggest that in the future they use xyz, but answer the question they are asking. Even be a bit of a cheerleader and boost their confidence. If someone is asking for code or a complete solution… Well then that is just lack of knowledge of what the community does. Simply answer that we – the community- would be happy to help, but what have you written so far? Yes, I know it can be frustrating. The exact same question has been asked a million times. This is something we can address right now. Start using empathy for the person that asks the question. We might see an increase in questions. We might see an increase in people here in the community. Here I got a great comment from Nic Teunckens – he pointed me to yes another blog. This blog is dated but still true. Asking Good Questions will get you Good Answers. I’m adding it here in case you don’t read the comments. I know there will be disagreement with me —- please do comment. I like to read the comments. I’ll reply back to them. Remember the only stupid question is the one not asked. Hi Michelle, Thanks for raising the issue. Some people on SCN think they are lords and they behave very badly and in very rude way. I now hate SCN there are some self styled gurus. Bu there are some nice people too, one must understand that what seems silly to you might be a do or die situation for another human. Also trust me most of the times refer to that link and next time search will be the common answer, click on that link it does not serves the purpose as it was not even answered there or I am not looking for that but the self styles guru wanted to rant out. Thanks again and really thanks to a very few people who genuinely help and are polite human beings. You spoke of old and new, of course SAP is not iOS or Android app development, if my user uses a module pool I use it. My client uses function modules i will use it but the self style gurus have problem with that too. Agreed. I did talk old and new. But it doesn’t really matter. The question could be something totally new. I want people to feel comfortable that they can ask questions. Remember the question you ask could be one that 100 people want to know the answer to. You’ve helped them and will never know because they found the answer by searching and getting to your question. Gurus. There really are some here. Also remember you don’t know what kind of a day that person is having that answered your question. If you get a bad answer take a deep breath and ask your question a different way. Or politely explain why that didn’t answer your question. You might be surprised when you get the answer you’re looking for! Found in your profile. No comments. Just thought it was interesting. Yes right that’s interesting and proves how valid the blog is and that is an evidence that the hurt goes so deep from self claimed gurus on SCN that I had to take protection from them. You raise a Good Point, and I like your Approach and Strategies to offering a Response that is least likely to offend anyone or insinuate anything in a Negative way. However I do feel that everyone could serve from some Etiquette, both on the Sender and the Receivers side. On that note, I would like to mention an excellent Blog from the past, stating “Asking Good Questions will get you Good Answers“. Even though this Blogpost was written for the previous SAP-Community Site, a lot of the Points are still valid on the Current Platform. And I don’t want to List everything out here (as a Rant). Rather, I want People to Read the Blog again and get the General Idea. Perfect answer! I do hope for more. The blog you have listed here is amazing. Yes it is on both sides. I think the one that does most damage is the person answering the questions. I just know I’d have a hard time asking a second question if in my first question I was told I was using obsolete code. Rewrite the entire thing. Eek! Not only wouldn’t I have the time to do that, it would probably be a bit of a learning curve. Re: posting links – we absolutely must not do that. See this blog. We’ve already discussed this subject quite a few times before, just search in Google for this: why was my question rejected site:sap.com. There are also other good blogs, like this one , this one, and this one that explain why the questions are usually rejected and the reasons for the ROE enforcement. P.S. What you are suggesting is, in fact, already rule # 7 in ROE. But it comes with rule # 3. So if everyone just followed the rules I believe we’d be fine. Yes all the blog posts are interesting – and also about how to ask a question. Rule 7 should apply. It doesn’t a lot of the time. I guess I should look more – but this isn’t about the way to ask. It’s about the way to answer. Yes, empathy is understanding what another person feels – and it probably is used incorrectly here. I want to understand what they are feeling (as much as I can). Next try to put myself in their shoes. I’m going back to when SAP was new for me. I had questions. I was scared to post them. Why? Because I didn’t want to look stupid. Yet at times there are answers out there that sure would make me feel stupid if I got them. So – empathy put me in their place. How many times does a harsh answer happen here? I’m guilty of it. I really quickly type something in without thinking about the impact. So I’ll agree to disagree with you on this one. Although I can say – yes, I used the word empathy to mean more than, just well empathy. Michelle, I don’t believe for a second that you would’ve ever posted a question like one of those I’m reporting almost daily in ABAP forum (“my client has a requirement… suggest a solution”). Your simplest question will most likely be well researched and thought through. Even when you just started with SAP I would never believe you’d ask about something that is found in the documentation. I’m the same way. I want my question to be answered and I value the time of people who volunteer to answer the questions. That’s why I find it very, very difficult to empathise with someone who just dumps the requirements on SCN, then sits back and relaxes expecting someone to do their job. Some good news: That “security” bug has been fixed. Woohoo!!!!!!!!!!!!!!! Great news. I tend to forget to copy my comments. I think that the way the forum works has made experts very frustrated: many questions are unclear, experts answer all possible solutions instead of asking for complements; it’s almost impossible to forward to threads “already answered”. That would be marvelous if SCN could work like https://stackoverflow.com (best of all forums I know). I’m struggling with the platform as well. But I know we need to build back our community. How? I’m not sure. Hopefully with kindness. I can understand the frustration! I really do. I rarely answer questions. I’m going to try to answer one here and there just to have a better understanding. I looked at stackoverflow. It does work really well. Would be a funny story, if it were only true. But it isn’t. 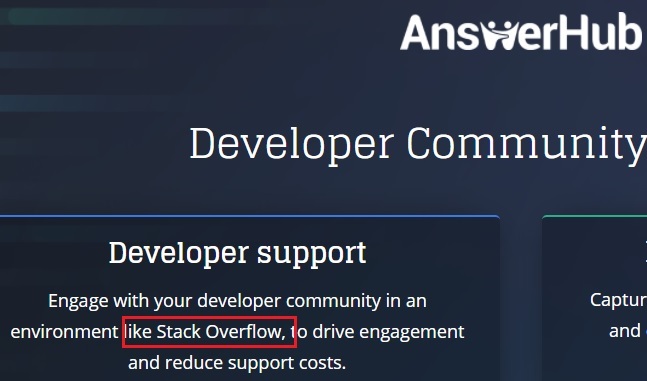 The technology platform behind answers.sap.com is AnswerHub, not StackOverflow. (see diagram in https://blogs.sap.com/2015/03/20/the-long-run/) . And, upon closer look, you’ll find that the operating model is also vastly different (reputation and moderation systems are completely different). Clearly they really are not quite StackOverflow. Neither on software nor on how to operate a Q&A site. I’d say, if you feel stackoverflow is the better platform, go there. Take the initiative and lead the tribe to the new lands of Q&A. I’m fine with that, heck, I’m already there. The thing is, that with the old “discussions” model we allowed for discourse and, well, discussions on topics. In some cases, everyone asking an interesting question could get the chance to discuss it with experts in that respective field. I liked that, but, as a matter of fact, this option was not that often used. Apparently, most consumers of the forum really just want the Question-Answer type of communication. More often than not, I choose “ignore” because that’s the one option that leaves me with most remaining mental resources and takes the least amount of time. Everyone is responsible for his own degree of engagement in the SAP community, and there is a whole life to be lived apart from the Q&A of this website. I do the same on stackoverflow and in the SAP internal JAM communities. So, concluding that the experts are manly frustrated by the platform tech. is cutting it short and likely won’t help with making this a more popular place to exchange know-how and opinions again. I think it has everything to do with the platform. One thing I will disagree about: I really don’t get the bit about obsolete practices. Why should anyone should feel offended by being shown a newer, officially recommended way??? One of my favourite things in my career are those moments where I learn a cool new way to do something! Why should it be the answerer’s responsibility to elicit the reason for using an outdated practice? If a question is asked, an answer is provided based on the available information. If the answer is insufficient, or if there’s a reason for doing things a particular way, the OP can respond to the answer. It is a discussion. Where’s the problem in that? Empathy is one of my motivators to answer in first place. True. “Empathy has me answering in the first place. “ There isn’t a problem in that. Sorry if i post here too the same answer i gave on Linkedin, but maybe it’s worthy. Put down the wooden spoon! I’ll be good! i can partially agree with you. First of all, most of those questions are just dropped there, without a real search before, not due the lack of experience but mostly for laziness: i’m checking one of that kind of question right now and it’s clear the OP doesn’t even bother to put the error message he got on google because if he did it, he could see PAGES of links leading to similar questions. Should i suggest to put in google the message error? When i got more free time to invest i did the wrong choice to do the job for the OPs, looking in google, posting the links and the pointing out the errors. The platform generates so much noise that good and interesting questions sink in the ocean of a tons of already answered ones. To get the attention on a good question i’m forced to share it on twitter! A community has to help to grow, as well as its members have to.. but ALL the members! Even the new one. If you just want to take without doing a bit of effort, sorry, you are killing the community. So, i think i’m doing more than i have suggesting the old discussions and alerting moderators. If the OP wants a good answer, she has to write a good question, specifying what she did, which is the problem, which search she did and why the results aren’t fitting. And this are the bases for a good community. It’s not a SAP related/SCN related issue. My 9 yrs old daughter knows that if she wants a clear answer she has to formulate a clear question. Have i to explain to grow up people this kind of thing? It’s clear i have, since the situation we are, but i found so… depressing! This because we are (should be) a community of professional people (and with professional i mean someone who knows how to interact and puts some brain in what is doing), from the fresher to the student to the uber-hyper-expert. Spoon feeding like this is so… demeaning (i do not know how to translate from italian elsewhere, sorry!). And Former Member , i’m sorry, the question Jelena Perfiljeva linked isn’t a good question from my point of view: you said “No functional and no BDC because i already searched”. Ok, what did you search (i.e. the search terms, threads you found….)? Did you try to debug to see if you could find a hidden standard FM in the code’s folds? Can you see we lack so many informations to help you? Hello Simone, I did not mean to show any arrogance because I am the one seeking an answer in that question. Simple truth may sound harsh but one who is asking can not be arrogant. So, I am not. I did not mean to show any arrogance because I am the one seeking an answer in that question. Plus, as i stated, the new platform limits my useful time here, dramatically! If i read a question not clearly posed, answering my points… i skip it: how can i know what the OP (you in this case) performed and if my time is worthy to help her (you)? Dear Simone, I have nothing against you. So, I see no point in turning the knife towards me. The point is empathy and I see my comment that you are so fond off as a shield that at least helps me to save myself from the arrogant, ego maniac and abusive – gurus on SCN who are the main players of the whole parent blog here who lack empathy and not me. Also my comment should help you to think if you try to think without your cultural bias that what might have been the previous experiences that one had to write it and FYI that is very polite, but I know you will play the culture drum again and I don’t know and really don’t have any interest to know what you mean by it but in our culture i.e the indian culture we help people with open arms and minds not bias and hypocrisy. Also I did not get an answer I will presume there’s none and I won’t cry that some J, K, L did not answer it. Does it really matters? I am a professional and I will find my solution. My last words and comment to this blog irrespective of any future comments or whatever here are- In my time I have noticed people from SAP and some users and real gurus are really helpful and polite but some X,Y,Z that includes mentors who have spent some time and earned some badges think they are gods, all such people should wake up it’s 2017. It’s not a world dominated by egomaniac grey hairs, rules of civility and politeness hold for every one and no one can just give excuses like the cultural crap you have been talking about. It’s very offensive Mister- I really didn’t like your cultural crap. Prasenjit, i’m sorry i gave you the impression i have something against you. i just tried to explain my point on how different backgrounds could (and i underline could ) influence how people react. It’s my believe and my experience, in true honesty, you can believe it or think i’m trying to justify or fool or whatelse the others. Again, i am sorry if i somehow offended you, i know i often mistep on others’ feet and have no problem into admitting it, and, even if i’m not a guru at all nor a mentor nor anyone else, i’ll take the egomaniac and walk back in the shadows. Just i do not take the grey hairs: i’m bald so no proof i’ve grey hairs! It might as well be unanswered because others chose not to answer after reading it. At least my reaction was “nope, won’t even bother checking”. I am irritated by wrong or useless answers as well but empathy goes both ways. At least people are trying to help. And I’d actually prefer to hear from someone else a confirmation, e.g. “no, I’ve ran into this too and didn’t find anything” instead of just radio silence. It’s just a personal preference though. I understand that some people might prefer no answer at all. Except in this case there is just no way to know whether there is truly no answer or it’s just no one answered. In fact, in quite a few cases I answered either with just “try searching for this” or even incorrectly. But then someone who followed me came in with the right answer because they saw my reply. You have the interesting experiences. I’m shaking my head. Yep – I’m cross posting for a bit…. Sigh. If the fear of appearing stupid prevented you from asking a basic question and you put more effort in searching and prototyping and found the answer by yourself – did this not make you a better and more confident consultant or developer? I can understand that in some cases it is unavoidable to use obsolete syntax – this might be a really old system or you have no time and budget to rewrite from scratch and test a monstrous program, but I would never ask a developer to rewrite his code so that I can understand it easier. Instead, I use F1 or ABAPHELP or the online documentation, or debug, or just ask the developer to clarify what this part of the code is supposed to do (I mostly look at code when there is some problem with custom developments which makes it a valid question). Yes, the newer syntax is a bit challenging for me at times, because I don’t see it used that often, but I see this as an opportunity to learn. Anyway, back to the empathy topic. This is a rather philosophical question. I guess, empathy goes down the drain when you fail to identify yourself with a person’s situation, which makes him/her feel less ‘human’ to you. I have tried to guide people how to make the most of the available online resources and improve their problem-solving skills – suggested suitable keywords, pointed out how to search and filter, suggested troubleshooting techniques, gave examples for them to try and find the answer on their own… In nearly all cases it did not work. The same person comes back, learning nothing, asking the same basic questions, expecting that somebody else should do the thinking and possibly their job. And this is the biggest fear: eventually you get to work with people who refuse to think and learn and you have to clean the mess they left. Because someone picked the easiest spoon-feeding suggestion (which sometimes is terribly wrong) and implemented it without thinking or doing research. This could be a generation gap problem or it could be the cultural differences preventing people from identifying themselves with others or maybe the industry evolved to the point where critical thinking and problem solving skills became optional, but when I joined SAP Community I did it to become better in what I do. Asking and answering basic questions which have been answered hundreds of times before does not benefit the individual and the industry in the longer term. It only makes the situation worse. Unfortunately, no platform by itself could solve this. Empathy won’t fix this either. Until companies and consultants realize that there are no real shortcuts to learning – nothing will change for the better. I do not see myself as a guru, a thought leader of any sort or as more skilled than many other professionals – I merely put effort before asking for help and learn in the process. I love these difference of opinions. “Being a better developer by not answering the question.” Hunting for the answer and building my own problem solving skills was a good thing. So I agree with you on that. But if I had a project that I was working against a deadline and I couldn’t find an answer. What did I do? I did it in a different way that might not have been a good way, but it worked at the time. So that didn’t make me a better developer. I look back a Jelena’s answer. She is one of the many people here that I respect and enjoy talking to. And yes, she has a lot of empathy. She pointed be to several blogs that covered the “same” thing written here. To many people looking at them, perhaps they do. To me, they cover the question asking and not the answers. But it could be argued that by helping people to write a better question, you will in fact be showing a way to give a better answer. Also it could be argued that the rules of engagement already covers what is in this blog. So should someone just point me to the ROE and not allow the blog? Maybe. Has this already been covered many times? Again maybe. I can understand that. I’ve been there where I have had to spoon feed everything to someone. Now that is beyond frustrating. And it would be horrible if the same person was asking for a quick answer again. I guess that would be what I didn’t understand. I didn’t trend the individual asking the question. Mmmmm…. If the person did not learn from your answer here – would they learn from their company? I did join the community to be better at what I do. Sometimes a question can help me more than an answer can. If someone thinks just slightly different than I do, it has the power to make me think slightly differently. Very cool. I did go to stackoverflow. The platform helped because of the way it lead me to different questions based on the one I was looking at. I didn’t try typing a question in. I wonder if it would have suggested answers. BUT I don’t want to lead people there instead of here. This is still a great place. However, there are more places of interest as well. When one site doesn’t work, of course I look at a different one. And yes, google search is perfect for that. What I look for here – is a love of SAP. Or at least a like of SAP. I look for a group of people that have that same background that I do. Someplace where I can write blogs and get interesting answers that make me think. And many more reasons. That is the subject of another blog. Back to answers.. There are some rants in the answers. But maybe that is only when a person has repetitively asked a question without a search. So which is worse the repetitive question or the rant? I also agree that some days I would give a really bad answer. (Not polite) I also think the frustrations with the platform has even the best of intended answers – rewritten into one line. I’ve been getting security issue. So I’ve taken to saving my answer and then putting it back. But when I forget and I write a lot. Let’s just say I don’t repeat my answer. No – I don’t see myself as a Guru either. I just worried when I saw some of the answers. Again I’m going back to a time when SDN was young. Most of the questions had not been answered yet. A platform can help. I honestly still believe empathy can help – to a point. I do still believe in unicorns and rainbows too! Your bit about “And this is the biggest fear: eventually you get to work with people who refuse to think and learn…” is close to the mark. While there are many genuinely interested people, I can also say from personal experience that there are also numerous individuals out there who will get a task, fling it out here, and get back to facebook / social chats / fashion blogs (yes, really!) while waiting for an answer. And there are also those self-destructive types who think it’s an embarrassing show of ignorance to have a SAP Help page open, let alone a book! I also know of individuals working on the same project as experts in a topic area, yet posting questions on here instead of having a 2 minute conversation. For me, empathy means spotting those who show a genuine interest and willingness to help themselves, and I’m more than happy to chip in on those questions. Very nice. I really like this answer. There is plenty of empahty, sometimes just not directed to the one asking the question. If you consider that this platform is by and for SAP professionals, then that means that you have to expect a minimum amount of knowledge, know-how, skills, etc. If someone is blatantly posting a functional spec and demands answers then that person is not an SAP professional but is fraudulent, a criminal. I have personally experienced the repercussions of this behaviour. I had to fix the mess left by a “consultant” who used spoon fed answers on SDN and other sites of the time and implemented them without proper knowledge in an SAP system. This came to light after 3 months when the basis team tried to implement a support package, the SPAU list then flagged hundreds of altered SAP basis components, he simply changed the SAP standard code and screens to sort of conform to the requirements. So this is not a lack of knowledge but a complete lack of professionalism and whenever you encounter people asking for complete solutions then it is my conviction that in those cases you’re obliged as an SAP professional to try to deter those culprits out of empathy for the companies that will be harmed when this is allowed to continue for a long time. Rob detailed it a bit more, kind of what I was about to write. This is a platform for professionals. This is for people who need some help to achieve something. Who want some input or direction to get something fixed or extended or newly developed. At least it should be. But the questions that get those “rude” answers you pointed out at the start are not those kind of questions. Nobody would write “Do some research!”, “Rewrite that with the new stuff!” or just throw in a link, if the question is well-written. And I don’t mean in perfect English, I mean with details, a good explanation of what is going wrong, what is supposed to happen and what someone already tried. Screenshots of error messages added and maybe a code snippet, where the issue is probably. If you put effort in your question, people will put effort in their answers. But if you just throw in “I got an error when clicking here.” or “I want to make it do <oneliner> .”. and expect people to mind-read, no amount of empathy will help. “Sharing is caring” is an often used motto. But this works both ways. If you don’t share enough detail in your question and can’t be bothered to answer follow-up questions, why should anyone bother with a (good) reply to your question? It does not matter, that you are a newbie. It does not matter, that you have no time to search. YOU get paid to work through those issues, the people helping here are not (well, I hope the SAP employees do actually ^^). So… yeah… that went on longer than I expected. The bottom line is: SCN exists to help you help yourself. Not to do everything for you. I would translate that as “You get out what you put in”, which is exactly the point you made. Perfect. When I get an answer I try to answer other questions. I can’t always do that due to work getting in the way. But I try. I do understand your point and Jelena’s point. It makes sense if you look at history. I guess I’m just wishing that it could be that person’s history. I haven’t tried yet – is it easy to see if they’ve written a lot of questions like that? A lot would depend on the day I was having as well. Empathy both ways. Then your action is resulting from that empathy. Yes – google is my best friend too! Steffi, you beat me to it. 🙂 Yes, the blogs are about asking questions but they were written by the people who were answering questions. (Former Member was one of the SDN legends.) And it was exactly because they’ve seen so many questions following the same bad practice (not searching, not providing details, etc.). So they thought “well, instead of giving the same answer to so many questions let me try to educate people in this blog”. And how did that work out? Bwahaha. There is no guarantee the people asking the questions would actually read the blog! But I do see your point. OK, so what would be a suggestion to empathise with this question? What answer can we provide? This is a rather typical and, sadly, not even the worse example. Where did the empathy go? Well, I guess it goes the way of the dodo bird when you go through dozens of such questions weekly. OK, ok, I can agree. My empathy would be to simply skip the question. If it was a REALLY good day, I might ask the following. Is the customer sending the fax or receiving it? SOST really isn’t triggered – it’s just the report on what is being sent in and out of the system. How is the fax set up? What is the configuration for it? Can you send a short message? And I suppose there could be more that I would ask. However, that would be on a good day. Most days, I’d just skip it. And your questions are already longer than OP’s own. 🙂 That’s the homework that they should’ve done already, as a professional reaching to other professionals for help. Yes, that’s why a lot of the times I would just skip it. When I had the time, I would answer. If a moderator removed such question, does it then mean he has no empathy? Does he just not have empathy for one while he has empathy for several hundred silent users who might potentially find this garbage in their search results? If you remove each question that shouldn’t be there, then you may start to discourage questions. If they are new, they may not come back. If there are 100 searchers they may be annoyed by all the noise. However if all the questions are answered, they would have their answer. No real answer to that one. Before I registered in SCN with my second P-user, in addition to notes search I used Google to locate SAP documentation or answers to problems that I could not figure out myself. I admit that I deliberately avoided clicking on links to SCN, because most often the result was garbage – link jungle and irrelevant or utterly wrong and dangerous suggestions. Many good consultants that I know do not perceive SAP Community as a place for professionals, because so many of the questions asked demonstrate lack of understanding even of basic principles. Allow me to give an example of how I transitioned between areas within a company. I had to pass two internal exams – one for user-level knowledge, including the business processes, the second one was for configuration. Only after that I obtained edit authorizations in the customizing client. Clearly, this is not a common practice. Encouraging people to participate should not be done at all cost. Being new is not an excuse for not doing your homework before you post. OK – well that surprises me. That they didn’t feel this was a professional place. I do understand the homework. I also understand that companies should teach the new people to search if they don’t know how. Participate at all cost. I’d say balance. The balance being perhaps removing the posts with the rants in the answers. There are some of these. Not a lot but some of these. I guess if the question is removed then perhaps the person will ask it a different way. I believe the moderators could be given some kind of a template for the message when a post is removed due to insufficient search. Something that could be clear and courteous. I’m really not sure why but some people just don’t put enough details in their questions or even misstate the questions. E.g. someone might have searched already but didn’t find an answer because, say, their particular scenario is different. But instead of posting “I searched for this keyword and I found <link> and <link> but it didn’t answer my question because this or that”. No, they would just post “How do I do X?” Then, of course, someone sees it, puts keyword in Google, finds 200 SCN posts about X and the question goes to the moderators. Next step is, of course, for the OP to get offended. How dare they?! I did all the search! Uhm… You did not tell anyone that. There have been literally dozens of these exact cases in the past years. For the life of me I can’t understand why would anyone think that when they just post “how to do X” everyone will understand it as they’ve already performed extensive research on X.
Anyways, as I said, we’ve already discussed this many times – how to keep SCN clean while trying not to alienate newbies. There are no simple answers, of course. It’s always difficult to keep a balance. But I believe in the past there was always an agreement that on a professional website it is expected to make some effort before posting a question and it’s on the OP to communicate what they’ve done, not on the community to guess. And the moderators need to guide them towards posting better questions that would not need to be removed. Just to clarify, moderators have a template for 13 different issues. I really love this answer. Templates would be a great approach. It wouldn’t fix everything – but it would fix a lot. Thank you for this important post and the follow-up discussion by everyone. I agree with what many of you said and will try not to repeat so I don’t break the ROE :). Thinking of a softer way to train users on how to search without getting the rejection experience: I’m working on activating a functionality called redirect that could merge a repeated question into an existing question and at the same time providing the answer the user was after but also guiding him to better search next time (following a conversation/request I had with @paul finnern). This feature isn’t working due to a bug and is in IT’s queue pending resolution. The goal of the first 3 items on this list is to increase empathy across the community where moderators will continue understand how members feel and for members to understand the same about moderators including why they are requested to follow the rules of engagement. The community rules of engagement are one of the most empathetic texts in our community. The rules of engagement are just one mean in our tool kit aiming to provide the best user experience to our members. Like Jelena Perfiljeva said, empathy is to understand what users feel. However at the end we need to make a decision after we empathize with all parties involved what’s the best path going forward. Our contributors have limited time resources and I prefer that they invest their voluntary and valuable time to support members who made an efforts on their own searching, and answering only questions that weren’t asked before. What I see in front of my eyes is the future content health and navigation experience. We’re just in the beginning of this journey but we are already seeing great results thanks to our users and moderators. Wow!!!! Excellent. I had no idea this was going on. It will help everyone learn and grow. What a great idea. It should be an interesting journey.